Sulfonamide or sulphonamide is the basis of several groups of drugs. The original antibacterial sulfonamides (sometimes called sulfa drugs or sulpha drugs) are synthetic antimicrobial agents that contain the sulfonamide group. Some sulfonamides are also devoid of antibacterial activity, e.g., the anticonvulsant sultiame. The sulfonylureas and thiazide diuretics are newer drug groups based on the antibacterial sulfonamides. Sulfa allergies are common,hence medications containing sulfonamides are prescribed carefully. 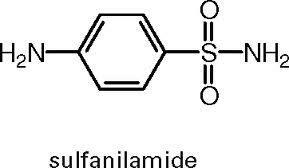 It is important to make a distinction between sulfa drugs and other sulfur-containing drugs and additives, such as sulfates and sulfites, which are chemically unrelated to the sulfonamide group, and do not cause the same hypersensitivity reactions seen in the sulfonamides. In bacteria, antibacterial sulfonamides act as competitive inhibitors of the enzyme dihydropteroate synthetase (DHPS), an enzyme involved in folate synthesis. The sulfonamide chemical moiety is also present in other medications that are not antimicrobials, including thiazide diuretics (including hydrochlorothiazide, metolazone, and indapamide, among others), loop diuretics (including furosemide, bumetanide and torsemide) sulfonylureas (including glipizide, glyburide, among others), some COX-2 inhibitors (e.g. celecoxib) and acetazolamide. Sulfonamides are prepared by the reaction of a sulfonyl chloride with ammonia or an amine. Certain sulfonamides (sulfadiazine or sulfamethoxazole) are sometimes mixed with the drug trimethoprim, which acts against dihydrofolate reductase. Sulfonamides have the potential to cause a variety of untoward reactions, including urinary tract disorders, haemopoietic disorders, porphyria and hypersensitivity reactions. When used in large doses, they may cause a strong allergic reaction. Two of the most serious are Stevens Johnson syndrome and toxic epidermal necrolysis (also known as Lyell syndrome). Approximately 3% of the general population have adverse reactions when treated with sulfonamide antimicrobials. Of note is the observation that patients with HIV have a much higher prevalence, at about 60%. People who have a hypersensitivity reaction to one member of the sulfonamide class are likely to have a similar reaction to others. Hypersensitivity reactions are less common in non-antibiotic sulfonamides, and, though controversial, the available evidence suggests those with hypersensitivity to sulfonamide antibiotics do not have an increased risk of hypersensitivity reaction to the non-antibiotic agents. Spectinomycin (marketed as the hydrochloride salt spectinomycin hydrochloride under the trade name Trobicin) is an aminocyclitol antibiotic, closely related to the aminoglycosides, produced by the bacterium Streptomyces spectabilis. It binds to the 30S ribosomal subunit in invading bacteria and interrupts protein synthesis. One form of resistance has emerged in the 16S ribosomal RNA in Pasteurella multocida. It is given by injection to treat gonorrhea, especially in patients who are allergic to penicillins. This antibiotic is no longer available in the United States. A resistance-conferring gene for spectinomycin can also be used as a selection marker in bacteria for molecular cloning purposes.